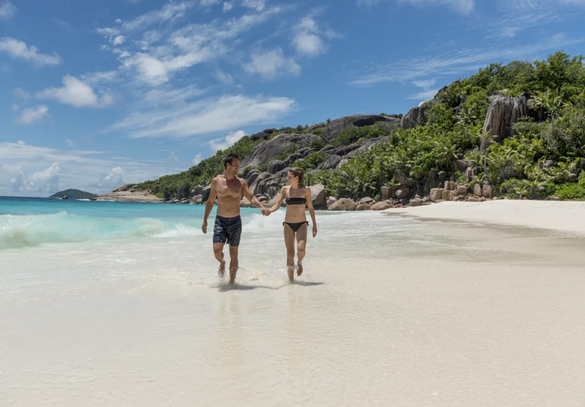 The serene pace of life, secluded spots and exceptionally beautiful landscapes are just a few characteristics that make Seychelles a top couple’s destination. Whether you’re adventure-seeking lovers, a nature-loving couple or a peaceful pair Seychelles has got it all. Warm and transparent waters, rich in well-preserved coral formations and blockfields, make the neighbouring small satellite islands and rock crops surrounding Praslin and La Digue some of the best snorkelling spots. You’re likely to come across surprisingly tame hawksbill sea turtles as well as many other colourful species. After sharing the amazing ocean world together you can admire the striking granite rocks framing the porcelain sand beaches. To feel as though you have a slice of paradise to yourselves, stroll along the quiet beaches of Curieuse island. It’s likely that the only greeting you’ll receive is from a freely-roaming giant tortoise. Red earth mountains and sculpture resembling granite rock formations make it a bucket-list worthy backdrop. Curieuse is inhabited and has no bookable accommodation so you can only visit the island as part of a day excursion. It is a 20-minute boat ride from Praslin. Spending a night gazing at the shimmering stars is one of the most romantic things you can do. Since the archipelago is in the middle of the Indian Ocean with low levels of light pollution and warm nighttime temperatures throughout the year, the conditions for stargazing are ideal. You can head to any of the quiet beaches wherever you are in Seychelles but if you go to one of the private islands you will have the best experience seeing the most stars. Create everlasting memories as you wander through the ‘Garden of Eden’, Praslin’s beautiful National Park. The UNESCO World Heritage Site, Vallée de Mai, is home to the legendary coco de mer palms, that can only be seen here or on Curieuse island. Choose from three hiking trails that have remained untouched since the 1930s and stop for a break to admire the waterfall. Providing an atmosphere of intimacy on the seashore, Del Place Restaurant in Mahé’s district of Port Launey is a great spot to enjoy a sunset dinner with your other half. Sample authentic Creole cuisine and seafood dishes whilst taking in the vistas of neighbouring islands. Nothing beats a bird’s eye view of the Seychelles in the privacy of your own helicopter! You can opt for a 75-minute package with Zil Air that takes you on an aerial tour of Mahé, La Digue, Félicité and Ile Coco as well as giving you a prime view of the giant palm trees of Vallée de Mai. Visit seychelles.travel to plan your romantic getaway. The Republic of Seychelles is a 115-island archipelago in the Indian Ocean. Tourism is one of the main contributors to the country’s GDP. Unrivalled beaches, exceptional hospitality and preserved nature make it the ideal holiday destination for peace and relaxation. British nationals do not need a visa to visit the Seychelles.